We locked the door and caught a plane to Sydney - the 18ft Skiffs are racing and of course DeLonghi on which Grant is crewing this year, came 3rd while we were in the air. Thursday was birthday day for Ian - happy birthday to Ian! We had breakfast with Grant and Hannah and went out on the ferry to watch the race. Then we had a lovely birthday dinner at A Tavola but I wasn't allowed to take any photos of birthday boy. The food was great - the staff were wonderful - they even sang happy birthday. We have managed 4 outings at the Fringe Festival which is the best for us. There are so many things you can go to and usually with us there is so much we do nothing but this year we have made a concerted effort. Three excellent out of 4 was good. Last Sat we went to a very crass event where I do hope they still have their day jobs. 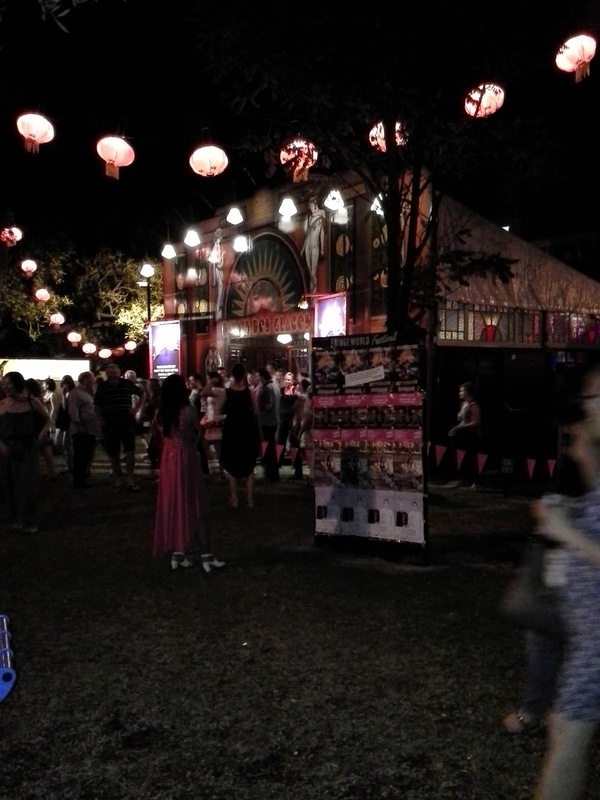 on Tuesday we went to La Soiree at the Pleasure Gardens which has expended this year. It was fabulous and just so professional. I loved all the acts so it was hard to decide on a pic but the puppets were brilliant and very clever. this particular one was amazing. 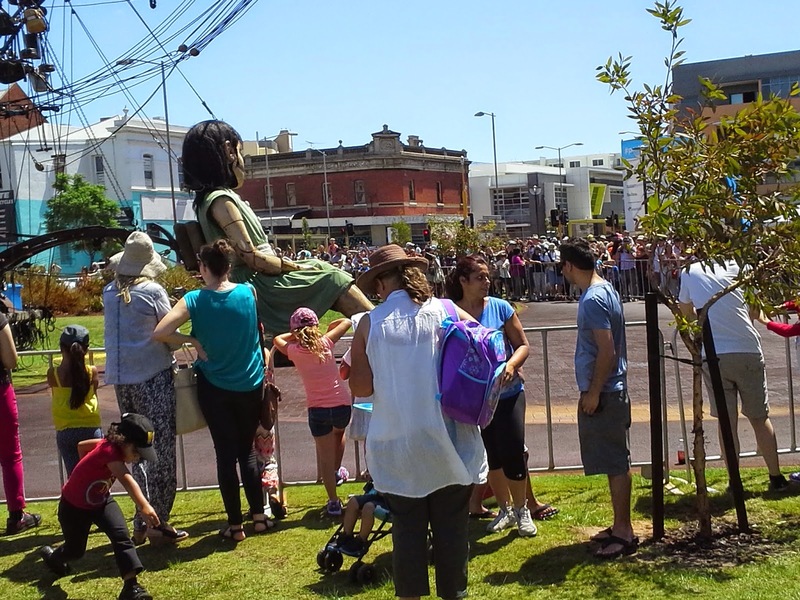 Perth has been Giant mad this week with these two large giants trotting all around the place. 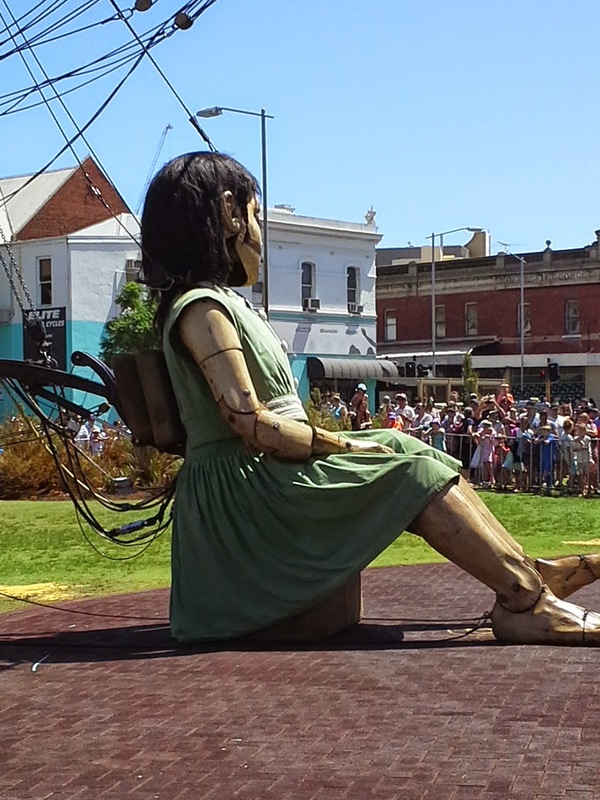 We went down to Weld Square yesterday and saw the Girl Giant snoring away. Fortunately there weren't too many people around. Cost $5million to put this event on. The 18ft Skiffs are having their champs in Sydney - Grant is crewing on DeLonghi this year - they came 5th today - we are looking forward to being there later in the week. I am using a wool thread and have loads to go but it is starting to fall into place. a) rugby report - yes - the Super 15 season has started and the Hurricanes won their first game for the first time in 5 years. Wonderful stuff. This week I made a little postcard for SAQA - I don't always take part in activities but I thought I could manage this one. I decided that my time should be spent finishing the pieces I started in my workshop in Adelaide and since I had things ready for weaving, I did just that. This is a little piece I made in class more as a sample - dry felting stitch and a little gentle wet felt. I knotted some wool which was in my box and added that. There is always room for some flower stitcher goodies. My woven piece - what looks like brick colour is actually light brown. I love the way the velvet embosses - so did the class - and I have added some of my gimp circles stitched down with a lovely new metallic thread we have which actually works and does not split or break.. This is part of another piece we played with the idea - woven - the little feature was a tiny bit of weaving I added in as a starter. Most of the class did much bigger pieces but I was looking to make a highlight. This is the bottom and the stamp I use for embossing velvet - these stamps are deep etched which makes them perfect. My little feature - hand dyed skeleton leaf - very fragile and some buttons I found in my stash. Then I thought I would try this transfer in my Khadi book - several people have told me about it using paper napkin and Glad wrap - works a treat and I shall try it onto other surfaces and see how I go. Now I can get onto my next project - my list is long. It's been very hot here and Ian has been working on fixing a broken pipe - well one of the tree roots had wrapped itself around it. Not the best time but with the tree needing water and our bore only working to this point, our excess water was not a pleasant bill to receive this week. However we think our beautiful tree is making progress - won't really know until Spring but there are two areas still full of green leaves and new growth and the poor cracked bark higher up is coming away as it oozes out the poison. Poor tree and what an evil person to have done it. Thanks for the emails I get regulalrly asking. Grant and Hannah's Christmas present finally arrived so Ian has been very busy plotting out another area in the back garden - he keeps moving it around but it does look lovely at night. We do so much enjoy our outdoor lounge and sit out very late - there is nothing on tv anyway. We have had drama here - Ian changed Harley's precious biscuits for a different brand and type and what a misery - sitting in front of her bowl not eating the new ones, rocking backwards and forwards, looking mournful and chatting furiously loudly and her tail going like crazy. On my way back from ATASDA yesterday where I took them the needs be for their challenge and demonstrated our wonderful new compressed sponge, I called into an IGA and found the 'right' ones - now I am in Harley's good books - for a change. She is a happy little bunny for the moment. We have been to a couple of Fringe Festival events and a couple to come - usually we are so overawed by the programme we never know what to go to. Last Sunday we went to Divalicious which was good if ever so hot in that tent but last night's night event was pretty crass and I am sure most people felt the same from the non-reaction. I just hope they have good day jobs. However it is good to see it happening and Northbridge is lovely and alive. Afterwards we came home and drank fizzzy and ate beetroot chips. I am still ever so busy with my family research especially for the grannies - being a history graduate means I am a good nosey parker. I have had some great photos sent by cousins of my paternal grannie but I feel another trip to NZ soon is on the cards. Amongst other things i need to check out some graves and places. If anyone is interested in a workshop, just email me. I will fly in and out of Wellington and be in the lower North Island. Dates open as I haven't decided yet.